Two weeks till we meet our princess Amellia, as long as her lungs are ready. 35 weeks tomorrow! WOW!! I can hardly believe how close we are. So close, yet so far at the same time. Everyday I am just thankful that she is still moving and kicking. Every Dr appt I wait for another great NST and for my blood pressure to be good and so far that is exactly what has happened. I just wish I could relax this past 2 wks but its just not possible. Every morning I "hold my breath" until I feel her first kicks and movements. And then say a quick prayer of thanks when she does. I am going to stay w/ a family member that lives less than 10 min away from my Dr's office this coming Tues and will stay w/ her until this little one arrives. (Currently I am 1 hr and 20 minutes away.) I am happy that I will be closer to the Dr, "just in case" I get a bad feeling and I also will have 2 appts the next 2 wks. again just for my peace of mind. Peace of mind- I just wish I could let myself relax and enjoy my last 2 wks prego w/ this precious baby girl. I am looking forward to being away from home although I will miss my hubby and "kids" our dog Maggie and cats Charlie and Oliver. However it will be nice to not be worrying about things around the house and just put my feet up and read a book or watch a movie. So 2 wks and I will be "holding my breath" the whole way. Please let this baby girl come home and be healthy!!! On another note they switched me to the Heparin. It defiantly isn't as user friendly as the Lovenox but I am getting the hang of it. It doesnt come in a pre -filled syringe and the needle isn't as smooth and easy to use but hey whatever it takes. Oh and the medicine burns a lot more but again no complaints here. I am scheduled for an amino Friday December 11 and if her lungs come back developed they will induce the same day!!! YAY!! So the countdown has begun... 36 days till we meet our baby girl!! I am so happy and excited but still scared. 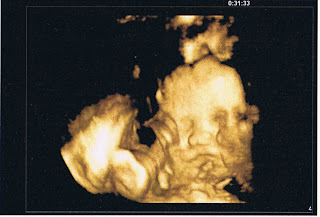 So just taking it one day at a time..
31 weeks tomorrow :D Wow.. that means in 6 weeks or less our baby girl will be in our arms. I am feeling really good and different about this pregnancy, I cant explain it exactly. I guess I really am starting to feel like the shots are working and that things will be different this time. BUT then my mind starts to wonder and I realize that 6 wks is still an eternity when you have had 2 losses. It doesn't help that we lost Emma at 31 wks. That thought defiantly keeps creeping in, but then I remind myself that Amelia is already a good pound or more than her sister at this point gestationally. I also try to focus on the fact that Amelia is very active and even has the hiccups at this very moment. I keep reminding myself things are different this time. But I am still scared. Thank goodness for weekly appointments and my wonderful awesome team of 4 high risk Dr's that calm my fears constantly. I have to continue to have faith and believe that we will bring this rainbow home. So I will keep moving forward, getting her room ready and counting down the days till we meet her and at the same time be grateful for every moment I get with her. I will be 29.5 wks tomorrow. So happy for that. We had an ultrasound one week ago and once again confirmed defiantly a girl and she was 3 lbs 2 oz. Which is great :D The dr was very happy w/ her size and everything else. Such a relief. We were in the room that has the 3D capability so we got a few shots of her as well. She was head down and "snuggled up w/ my placenta" as the tech said so we couldn't get a great straight on shot but the ones we did she had the cutest, most perfect little bird lips and adorable nose. Of course I'm her mommy so that's my opinion. We even could see in some of the shots that her eyes were open. Very cool, never saw that w/ the other two. Next Tues the 27th I will start weekly NST's and appts. And then 2 wks after that another ultrasound to check her growth yet again. I also have become very obsessive about tracking her busy time of the day and doing my kick counts. A good friend of mine gave me a Kicktrak that stores the last 10 days and how long it took to feel 10 kicks, movements etc. She is consistently active when I first wake up around 8-8:30 and most of the morning. She seems to sleep more in the afternoon and then is more active again after dinner. My Dr's tell me that if I notice the slightest change in these or seems to take longer to feel her 10 movements to call and come to the hospital to be checked. They also told me that kick counts are more important diagnostically than even having a Doppler to check her heart rate at home. This is due to the fact that a babies heart rate can vary so much anywhere from 110-180. So even if that number seems low it might not mean a problem. But seeing a change in her movement is an indication that there maybe a problem. Most mornings she is cooperative and I get my kicks/movements fairly quickly but some mornings she is a bit slow and for a few moments I begin to worry and wonder if we will be making a trip to the hospital but then she will "wake up" as to say I'm ok mom. I cant believe that she will be in my arms in less than 8 wks. Some days that seems like an eternity still but it really is right around the corner. The next few weeks will be hard due to the fact that we lost Emma at 31 wks. But overall I really do have a good feeling this time. Every time I get a great report at the Dr's. I think wow we really will make it this time. Don't get me wrong I still have the occasional doubt and worry.. but trying to focus on the positive and stay optimistic. I am finally starting to get excited and am hopeful for a great outcome this time!! 25 1/2 wks... 12 or less to go!! WOW.. can it really be 2 years since all of this craziness began that has now become my "normal"?!? Two years ago I awoke with a bad feeling.. Emma was always one to not let me sleep in because she was hungry but this morning I awoke at 10am. I laid in bed poking my belly waiting for her to respond with a kick. NOTHING.. I don't remember how long I waited but I called the hospital (b/c it was a Saturday) and started crying just trying to get the words out to the nurse. She said just come on over and we will check everything out, its probably nothing. I also remembering sitting in the office downstairs getting registered. 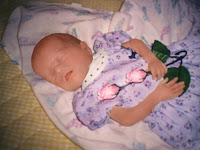 I was 31 wks so I wasn't yet registered for when I would give birth. I answered all these questions and just hoped in the back of my mind that everything would be ok. They got me upstairs and down for monitoring right away. And then it started... The nurse had trouble finding Emma's heartbeat, several nurses tried but to no avail. After the first 10 minutes they tried to get ahold of my OB but he was out of town, so the on call Dr was called instead. After 30 minutes of them trying I just new that something was terribly wrong. 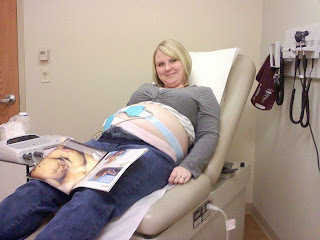 My fears were confirmed when the on call Dr, Dr. M did an ultrasound and had to tell me there was no heartbeat. I am so sorry! I lost it, broke down in tears... how could everything go so wrong so quickly. I had a perfect pregnancy with no problems and then BOOM she was gone. The rest of the day was a blur, I was induced and at 7:22 pm our firstborn, our perfect 2 lb 3 oz baby girl Emma LaRue was born. We said hello and goodbye at the same time on that awful day 2 years ago today. Emma my love you will always be my firstborn. I will never forget all the "firsts" I experienced while pregnant with you. I am so thankful to have loved and carried you for the 31 wks I did. I will always miss you! I really dont have much to say. I am happy to be in my 19th week. Feeling good, emotions are up and down. Still loving my doppler which is just the reassurance I need right now. Baby girl is making her presence know more and more but I still havent been able to feel a kick on the outside, nor has her daddy. But she has given me a couple good pops here and there. Another reason I dont have a lot to say is a very dear online deadbabymama that is pregnant with me (about 2 wks ahead) found out her little girl has Trisomy 13. Its not good news and I just cant stop thinking about her, her family and her precious little girl. She has had lightening strike twice now. I want to be there for her in anyway possible but at the sametime I remember the hurt of seeing others have what you want so badly. Its a catch 22 and so I have been quiet. So (((HUGS))) my dear friend!! I am just so sorry, there truly are no words JUST TEARS!!! Today has been a bittersweet day. At this time last year I was in full blown labor with Logan. But as we all know it wasn't an excited, joyous labor but rather just a get through this knowing that at the end once again we would say hello and goodbye to him at the same time. I really do believe that labor is harder and takes longer when the baby has passed. Logan was born at 9:18pm one year ago. WOW.. hard to believe its been a year... I remember so much of that day vividly as if it just happened yesterday. I went in for my weekly appointment and my OB couldn't find the heartbeat. I could tell he was worried and I was starting to cry when he put me in a wheelchair and wheeled me next door to the local hospital for an ultrasound. He said he could just be laying the wrong way, don't give up yet. They got me down right away and immediately the tech said I'm so sorry but there is no heartbeat. I broke into sobs, I really thought I would only hear those words once.. almost a year before when we lost Emma. But once again there were those awful words. They admitted me and took me up to a birthing room, the one I had been in just 4 days previous for Logan's non stress test and stress test. But this time there was no hearing the beautiful heartbeat... Logan Thomas Kellar born "sleeping" at 9:18 pm, 5 lbs 8 oz, 19 inches, perfect in every single way.. if he would have only taken a breath. So today I remember my precious Logan and the wonderful 9 months I had with him. I will miss and love him always!! But we also move forward with this current pregnancy and the hope that Emma/Logan's baby sister ~ Amelia Rose will come home!! Tomorrow is Logan's 1 year anniversary. Hard to believe that last year at this time I was having my last moments with my precious baby boy. I miss him very much but I feel that I am better handling his one year than I did Emma's. Although a big part of that could be the fact that I was also grieving the loss of Logan at the same time and everything was compounded. Or perhaps this new LO in my belly is helping me find some peace as well. Either way though I have had my rough moments over the last month/week and I know I will probably have a moment or two tomorrow as well. I really cant believe that its been a year since we said hello and goodbye to our little boy. MOMMY LOVES YOU SO VERY MUCH!!! In the past few weeks I have been remembering my times with Logan. I have decided to by date record some of those memories. 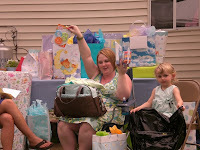 Saturday, July 12- Friends/family had thrown a coed baby shower for us. We had so much fun and I remember that night and the next day just looking through all the gifts and getting so excited to meet our little man. Friday, July 25- My work threw me a surprise baby shower. I had no idea and was so stunned I started to cry. They were all so generous and many of them went together and purchased my glider and ottoman I had wanted so badly. All the gifts barely fit into my car. After work that I day I headed down to Pittsburgh for a weekend with Tommy's aunt and a baby shower for a friend that was prego with her rainbow baby boy as well. Saturday, July 26- Chrissy's baby shower. She had a difficult pregnancy and went on bed rest early on. She was just past 34 wks and had been released from bed rest and was able to attend her shower. 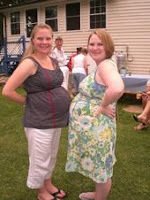 Our other friend Michelle was also prego w/ her rainbow baby boy Vinny. We were all due about 1-1.5 wks apart. And our other good friend was at the shower with her little rainbow miracle Lilly who was 2 months old. We all couldn't get enough of here. I remember holding Lilly and Logan kicking and going crazy at first but then they both settled down and feel asleep. What an amazing feeling- a baby inside and holding a baby as well. A picture of all us girls. We were all so happy and excited!! After the shower I went back to Tommy's aunts and we decided to go see Mamma Mia at the theater. I really enjoyed the movie and all the music. Logan was "dancing" and moving to the music as well. I just sat w/ my hand on my belly feeling his every move and just felt so happy and content. That's one of my best memories while prego with him. This little device is such lifesaver for me right now. Anytime I get the slightest panic or a full on "freak out" I just lay down, find the baby's heartbeat and marvel at the sound. It is truly the best sound in the world right now!! Thank you my dear Liesel for allowing me to borrow this wonderful Doppler!! Its giving me some peace of mind and calm when not much else is. So there's that. Still taking it one day at a time!! On another note a fellow deadbaby mama had her daughter by emergency c-sec on Sunday @ 29 wks. She noticed a decrease in kicks (as she was regularly doing her kick counts) and went to the hospital.. this is what saved her precious little girl. Kick counts are SO IMPORTANT!! She is holding her own for now but she has a long road. Keep them in your thoughts!! And its my parents 30th anniversary today!! Happy Anniversary Dad & Mom...way to go!! Well I have made it 4 months by the end of this week. In 2 weeks at my next OB check and ultrasound I will be 1/2 thru this pregnancy (b/c they will most likely take this little one by c-sec/ or induce me @ 37 wks). WOW!! That's a good feeling. I am still nervous but just for today I am trying to enjoy what is happening. 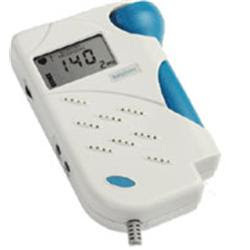 Speaking of that, a wonderful friend of mine, love ya Liesel sent me her Doppler to use while prego. I have been able to find the heartbeat 2x so far. I am trying not to go overboard with using it all the time. But last night I just marveled at my baby's good strong heartbeat in the mid 150's. I must say that is the BEST SOUND IN THE WORLD!! I recorded it on my phone so I can just play it back every once in awhile. Then as I was falling asleep I felt my first definite "flutters". As if this LO was saying I'm in here and I'm ok mom. I do love those first flutters and cant wait till I get some good kicks and Tommy can feel it as well!! On another note I am quickly approaching the 1 yr mark for my precious baby boy Logan. Its hard to believe that last year at this time I was 8.5 months pregnant and getting all ready for him. Its sad but at the same time I feel a certain peace about it as well. I miss him terribly as well as his big sister and I will always have pieces of me missing. But I also know that letting go a bit is good for me and this new LO. In fact the ultrasound where we will hopefully find out boy/girl is on August 4th (Logan 1 yr). I scheduled that without even realizing but again I think its a good thing. A moving forward and yet remembering as well. I love you Emma/Logan and miss you both very much!!! Meet Baby # 3 @ 12 wks and 3 days. He/she is measuring bigger and about a week ahead. That is big news b/c Emma/Logan both were very small for their gestational age. Which the Dr felt was b/c of my placenta not being as healthy from day one and then combine the clotting issue and well its not good. So measuring a bit bigger for me was exciting. Also all of my testing for downs/ trimsomy and other chromosome problems came back negative. More good news. And I am also happy to say I am in my 2nd trimester. So 1 down and 2 to go. I can do this just focus on one day at a time and BREATHE!! WOW.. I knew I hadn't posted in awhile but didn't realize that it had been over 2 months. Guess I def have some catching up to do. I was rereading my last post at the beginning of April and how at the end I said I hoped that month was our month. Well it turns out it was. I know many of you already know but yes we are pregnant and due January 2010 although more than likely we will have our little one in December sometime. April was a happy and stressful month all at the same time. On the 24th I was unexpectedly laid off from work with no promise of a return. I was scheduled for AF the next day or two. I remember thinking on one hand I hope we aren't pregnant b/c that brings up so many issues with not working, need insurance etc. But on the other hand I kept thinking that if we aren't we would be waiting to TTC once again for who knows how long and that was really hard to deal with. I waited till Sunday to test, I thought I saw a faint line but then talked myself out of it. Tuesday rolled around and still no AF, so I took another test and this time there was a definite second line. I pulled out the first test and the pink line was definitely darker on the 2nd test. I was excited and scared at the same time. I knew DH and myself would be stressing about not only the pregnancy but insurance and everything else. We both were mostly just in shock at first and holding our breath to see if this one would "stick" so to speak. I saw my regular OB and he scheduled an ultrasound to check for viability and a heartbeat. I had that on May 22, at 7 wks 6 days. 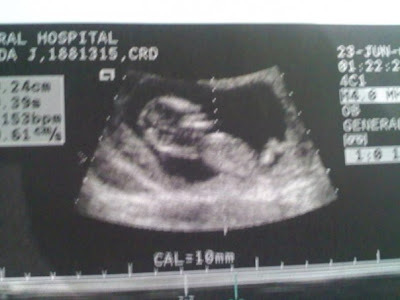 Our bean was on there moving around and more importantly a good strong heartbeat. I was so relieved. After the ultrasound we started to tell family and some friends. Then on June 9th I finally met with the high risk Dr's (I had a consult w/ them back in Oct.) They had me start on injections of Lovenox 2x a day right away. I was also very happy and impressed b/c before I could even ask "What the plan this time?" he lined it out, especially the big weeks and what type of testing and so forth we will have this time. I told him emotionally I cant make it to 40 wks and he said the furthest he would ever let me go is 39, I said that's still too much, how about 36/37 wks. He said earliest he would like to do anything is 37. Do an amino to check the lungs and then be induced or c-sec. At this point I am thinking c-sec just b/c it takes more things out of the equation for problems such as when in labor. But I also feel very confident in the 3 Dr's I will see and that they will do what is best for me and our baby. I am still so scared but for now I will take it a day at a time and rely on the Dr's. Complete the list of 8's. ~Helped Tommy water all our flowers and his garden, everything is beautiful!! ~Know that at the end of this pregnancy that I WILL bring home this rainbow baby!! ~Go to sleep and wake up with our baby in my arms...skip the worry and anxiety filled months to come. I had a very vivid dream last night, so much so that when I first awoke I had to figure out if it was real or not. I don’t remember all the specifics but I do now that I had a baby boy in it and it wasn’t Logan. I couldn’t see any distinct facial features but I knew he was mine. And at some point in the dream someone asked what he weighed and I said 4 lbs 1 oz. I cant remember specifically but I’m pretty sure he was early and defiantly a preemie at that size. I know my mom was in the dream and I think my grandma too. I don’t remember too much else but I know I was happy. Then I awoke and realized it was all a dream and it just set the tone for the rest of the day to be a tough one. I cried in the shower and several times at work as well. Yesterday was 19 months since Emma was born sleeping and Saturday will be 8 months without Logan. Once again I thought that by now I would be prego again and although each anniversary would be hard that somehow it would be easier to cope knowing there was a new life growing inside me. But that’s just a dream right now too. I feel like a broken record… I wanna be pregnant, I wanna be a mom to a living, breathing baby, I don’t want to be sad ALL THE TIME, I want to feel “normal” again. I JUST WANT WHAT SEEMS TO COME SO EASY TO EVERYONE ELSE!! A BABY!! On a different note, I am going to see a different Dr next week. He is a chiropractor but also deals with emotional/nutritional things as well. My cousin who had a late miscarriage @ 19 wks a year or so ago, went to him b/c she was having a really hard time dealing with everything. He really helped her and she feels that he will be able to do the same for me. I REALLY hope she is right, b/c I need to find a way to deal with this better than I am now, and I WONT go back on an antidepressant. Not that I have a problem with them, but for me they just don’t do the trick. So anyway… I really hope this Dr. K can do something/anything for me. A little over a week and I’ll know one way or another. I keep trying to tell myself that the longer I wait to get prego the better it will be. My body will be more prepared. But I think it’s had long enough… time to get this show on the road. Time for a BFP and OUR rainbow!!! PLEASE LET APRIL BE OUR MONTH!! I feel like I have multiple personalities lately. Not in the “crazy” way, but just in the sense that I have to put on this particular “face” that everything is ok, fine and dandy. I put on this “face” every morning when I leave the house and for anyone that see’s me that is who/what they see. I am kind, friendly even jovial at times. But deep down the other person (the deadbabymamma me) is hurting and all she wants to do it crawl back in bed, pull the covers over my head and wake up when I have my rainbow in my arms kicking/screaming. I miss the old me- the me that was a pretty happy, all around nice person. I used to smile by choice and generally enjoyed life. But anymore it just seems as though EVERYTHING is a reminder of what I don’t have. I remember after both losses the acute pain I would have even just going to the grocery store. Seeing all the families, moms, pregnant ladies etc, I would rush around and try to get out of there as quickly as possible. Well I seem to be back to that anxious, overwhelming feeling once again. All I can see is what I am missing- the 18.5 month old, Emma and the 7.5 month old, Logan. Wow- I would certainly have my hands full. Instead I can run around and do whatever I please b/c there is no one else there to worry about. SIGH… In my mind at this point I thought for sure I would be prego again. Scared/nervous but baking another little one. But no, that isn’t the case either. Instead I plaster on a smile and pretend I am “OK”. But as soon as I am alone in my office, or the bathroom or even in bed at night, watch out b/c out comes the other me along with tears. I really do believe that I have cried more tears in the past 1.5 years of my life than in my almost 27 yrs of life. Buckets and buckets full… I feel as though I am always right on the edge of completely losing it. I just heard a fellow deadbabymamma had a perfect beautiful baby boy last week and I am so happy for her. She deserves all the happiness in the world. And for just a second it give me hope that maybe one day I will be one of the “it can happen” stories. I just hope that I can weather my multiple personalities until then. I keep going MIA… for one thing I have been insanely busy and another just haven’t known what to say or write. Many bloggers write everyday about what they are doing. For me blogging is an escape and putting things into writing that I just can’t seem to find the words for, or is just too painful to discuss. So anyway, I am back. Since I last wrote, I pasted 18 months without my Emma and 7 without Logan. Hard to believe… it feel so fresh and new recently again. I don’t cry all the time like I did at first but I just feel completely surrounded by this sadness and I just can’t overcome or lessen the pain. March 5th- marked the beginning of this horrendous journey that is still going on. March 5, 2007 is when I found out I was pregnant with our baby girl. I remember how excited we both were. 2 years I have been on this road. 2 yrs, 2 pregnancies into the 3rd trimester and still no baby in my arms. WOW… Perhaps that has to something to do with why I feel so blue and sad all the time. Sure I can put on a good face when I need to but deep down I am barely holding it together. 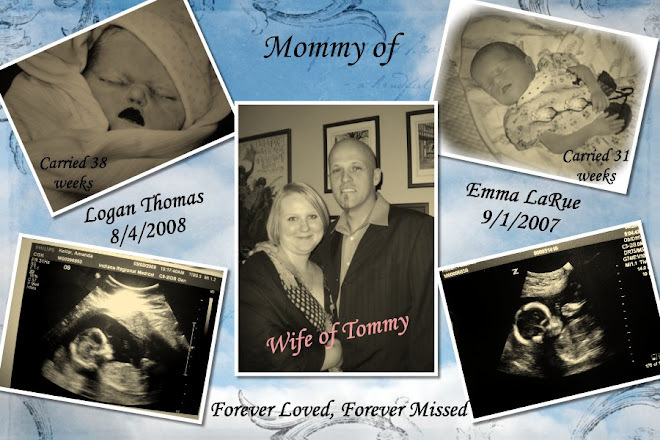 When we lost Logan, Tommy and I had discussed waiting nine months to a year before TTC again. As time passed though I knew I couldn’t wait that long, when I saw Dr. T in October, it had been 3 months and he told me I needed to wait at least 3 more. He recommended 6-12 months. Ok I can handle that I told myself. So January rolled around and we unofficially ttc. I tested 3 days early and there it was a BFP. Just as we were starting to get excited, I started to bleed and when I tested again, it was BFN. What happened? After talking to my OB, he said it was a chemical pregnancy or very early miscarriage, they are fairly common but most women don’t know about them b/c they don’t test early. Sure I had to be the impatient, anxious one. So anyway we took off one month and are hopefully back on for this month. The part that is so hard is, at some point in my head I told myself I would have a baby in my arms and at home in the year 2009. I wouldn’t have to go a whole year without getting my rainbow. Originally that gave us 3 months of ttc before we would be into 2010. Well SUDDENLY it’s the “last chance” so to speak. If it doesn’t happen this month, I WONT HAVE MY RAINBOW IN 2009! Sure that doesn’t sound so bad but for me it seems like the end of the world. I feel selfish even saying that b/c I know there are so many out there that have been ttc for years or even those that cant conceive and here I am complaining but for me that’s how I feel. I always worry about how I will make others feel and I truly hope that doesn’t upset anyone. But we all have our own “things” to deal with. And that is mine. So here’s hoping that I get pregnant and more importantly that this lo STICKS. Baby steps… one day at a time. On another note, my BIL came and visited and stayed with us last week. It was very nice to see him. It was a busy week but nice. He was the first one to stay in the nursery since it has been finished. Before he came my mom and I straightened up and made more room. Then Tommy ran cable up to the room so he could watch TV. It was REALLY hard to be in that room. Everything is ready… the clothes are still hanging in the closet and others in the dresser. There are toys, and a crib and stroller etc. We put a sheet over it to make it looked more organized. After my mom left I cried so hard… for what could’ve been. I'll keep this short and sweet. Not pregnant after all. Not sure if it was a chemical pregnancy or early miscarriage but whatever it was, it wasnt a little one and not pregnant. Really bummed and sad and well nothing else to say. I am sorry that I got everyone all excited. Sorry! Well I am back. I have been really busy and just not a lot to say. But a lot has happened in the past 6 weeks. First, long story short I had been out of touch with most of my family for 5+ years (my fault) but that has all changed and we have been making up for lost time over the past few weeks. It has been wonderful and it was as if we just picked up where we left off. No awkwardness, just kindness and love. I am loving every minute! My mom and I cant spend enough time together. Our first weekend together we stayed up until 4:30 am just talking. That same weekend we went and visited w/ all my uncles, aunts, cousins, and “nieces & nephews”. I cant believe how they have changed and grown up. They were so sweet. The youngest, Noah was only 2 when everything happened and didn’t remember me, but he gave me a big hug and called me Aunt Mandy. Brought tears to my eyes. The 2 girls Molly & Emily were 8 & 7 when I left, so they of course remembered me, they were so happy and excited to see me. It was quite the “family reunion” so to speak. Here’s a few pictures. The next big news I just learned as of yesterday. WE ARE PREGNANT! YEP, I GOT A BFP YESTERDAY! It was our first month officially trying and I wasn’t going to test until Wed. but had an extra test and thought lets just see. 3 minutes later, there was the one word PREGNANT. I was flabbergasted, shocked and started to cry. Tears of joy/happiness mixed with fear. I was trying to figure out how to tell Tommy in a cute way, so I had bought him a new pair of jeans the day before and he hadn’t seen them yet, so I put the pregnancy text in the pocket sticking out and told him I hoped he like the jeans and to pull them out of the bag and have a look. At first he didn’t see the test, and then he just looked and said “No way. Your pregnant”. He is very happy but scared and anxious as well. Then today I put the test in a box and wrapped in up and gave it to my mom and dad and said it was just a little something from Tommy and me for everything they have done for us. My dad didn’t know what it was at first and my mom thought for a minute, a purple marker, what? Then they both realized and got very excited. We are all very happy but you can definably tell we are somewhat reserved due to the anxiety as well. There are a couple of pics below. My mom will probably scold me b/c she say she looks terrible, but she just isn’t feeling well. I had to “capture the moment”. Part of me wants to “shout it from the rooftop” and the other part keeps saying it so early and things could go wrong… for the moment though I am just going to try and enjoy. Pretty sure I am still in shock and it hasn’t sunk in. I called Dr. T (high risk OB) and I have an appt. with him on Wednesday Feb 25 for a viability scan and consultation and also a script to start the Lovenox. So till then we will just wait and see and KFC that there is no bleeding or spotting between now and then. Baby steps… one at a time.